Cruising down the great St. Lawrence River: what a terrific way to celebrate Canada. 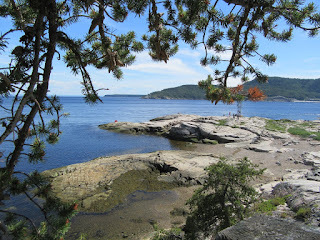 We found Cap-a-l’Aigle to be a terrific stop between Quebec City and Tadoussac. The small harbour was well protected. The people were very welcoming and friendly. The washrooms and showers were new and well appointed. Finally, there was a great little restaurant over the marina office that put on a great lunch. Afterwards, we took a nap, as we were all tired from our 0230 start to the day. 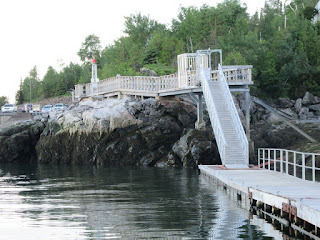 Later in the day, at a crew meeting to discuss the July 1st cruise to Tadoussac, we determined it would be another early morning to follow the advice in our cruising guide, so we were off to bed very early. 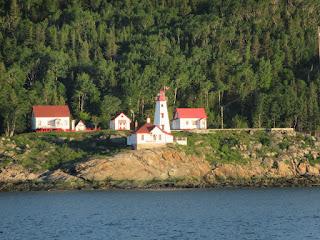 It is a 40 nautical mile cruise to Tadoussac and our cruising guide said we should arrive at the Prince Shoal Lighthouse (entrance to the Saguenay Fiord) two hours after low tide at the nearby Pointe-au-Pere tidal station on the south shore of the St. Lawrence (we’d need to arrive at 0824). This meant we’d need to depart at 0430 hours to make it on time. We awoke at 0400 to a sky that was already quite bright and we were off the dock by 0430 to see the sun rise at 0445 over the horizon on the endless ribbon of water of the St. Lawrence River. It was a spectacular morning with clear, dry air, with good warmth to the sun matched by a chill from the 11 degree C water. We enjoyed speeds of 9 to 12 knots over the ground, thanks to the ebb tide. Along the way we saw two belugas and had multiple minke whale sightings and had to slow down and occasionally stop while the whales made their way by us. Such a thrill! We also saw a grey seal and puffins. A few miles before we reached Prince Shoal Lighthouse, the St. Lawrence flood tide began and our speed dropped dramatically to 5.5 knots, but as we completed our turn right on time into the Saguenay Fiord, our speed picked up to 8 to 9 knots as we took advantage of the flood tide into the fiord. 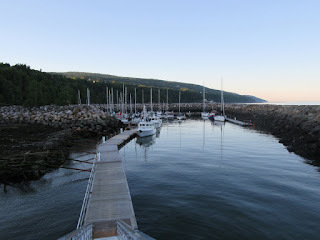 It was a short run in to the town of Tadoussac where we were greeted by an enthusiastic marina employee named Alex. The docking space is limited and he sure knew how to pack the boats in. 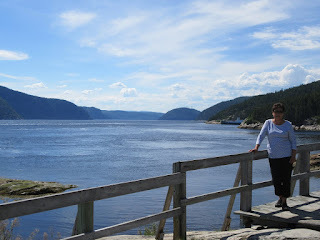 Tadoussac was much more than we expected. 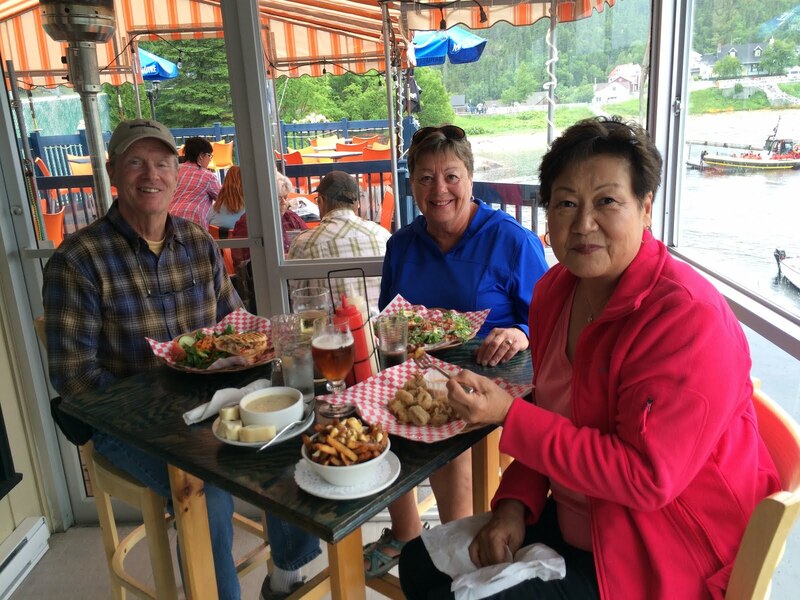 The village is nestled into a lovely horseshoe shaped bay with a tree covered hill all around. 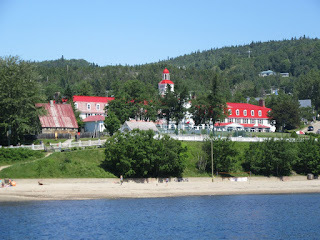 Two churches and the Hotel Tadoussac, with its bright red roof are the dominant landmarks of the town. The Tadoussac marina is on the northwest corner of the bay and the balance of the bay is rimmed with a lovely sand beach that grows dramatically during low tide. Jacques Cartier came to the site in 1535 and found Innu people using it as a base for hunting seal. Later the Basques form Spain conducted whaling expeditions on the river. 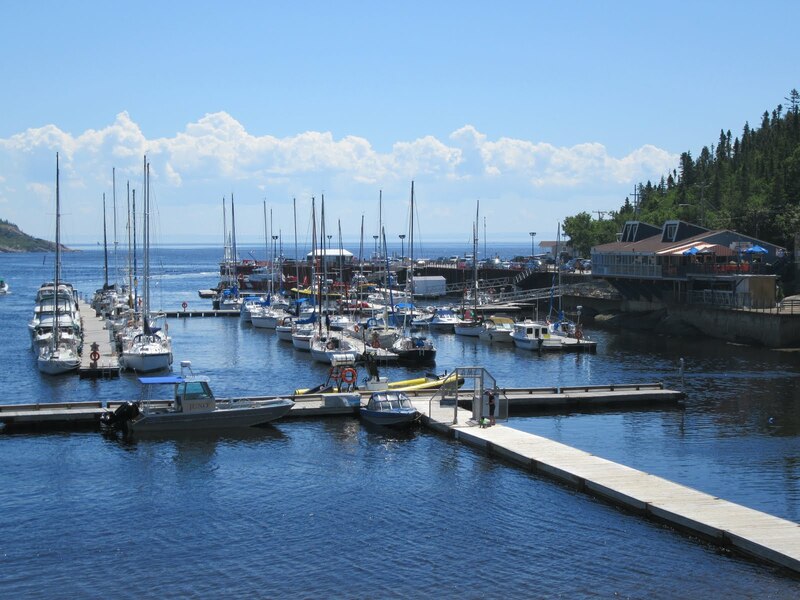 Tadoussac was established at an Innu settlement and in 1600 it became France’s first trading post on the mainland of New France. 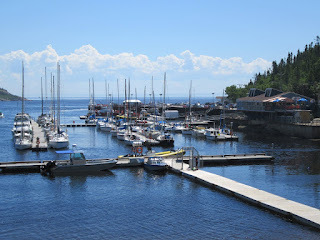 It is the oldest continuously inhabited European settlement in Canada and the oldest surviving French settlement in the Americas. The frontier was harsh and only five of the sixteen men survived the first winter. By the late 17th century, Tadoussac was the centre of fur trade between the French and First Nations peoples. Colonists from the Tadoussac area were also involved in whaling from 1632 until the end of the century. In the 19th century, industrialization reached other parts of Canada and tourists discovered the appeal of this rural village. Wealthy Quebecois built vacation villas. In 1864 a Victorian hotel was built and later it was lost to a fire. 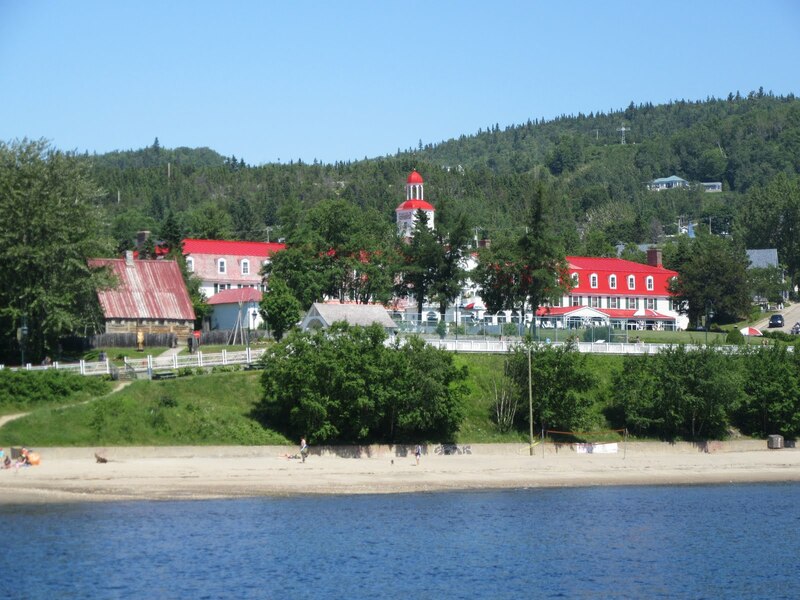 In the 1940k’s it was replaced by the large Hotel Tadoussac. 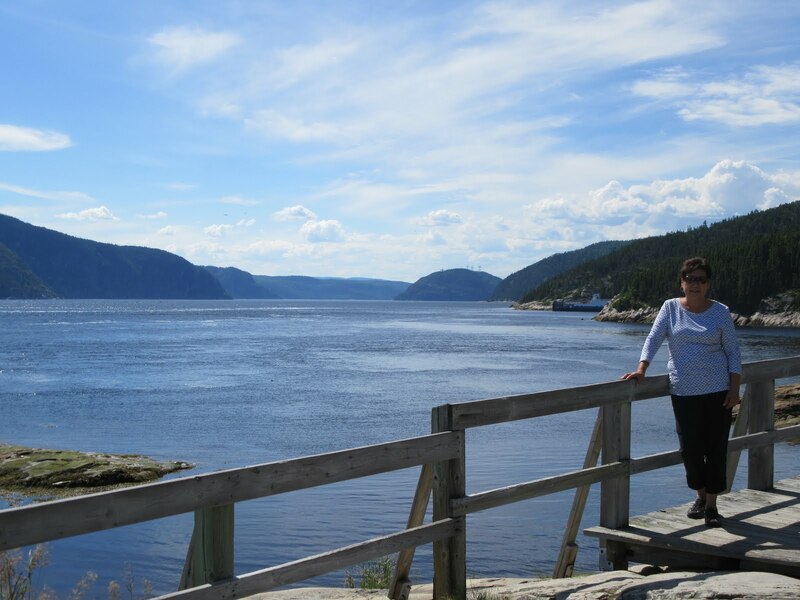 Today it continues to be a major tourist destination because of the rugged beauty of the Saguenay fiord and its facilities for whale watching. 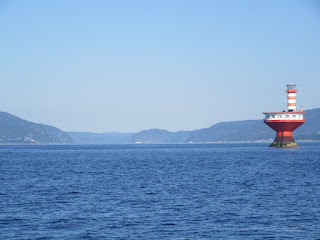 Between May and October up to 13 species of cetaceans, including blue whales and humpbacks, are found in the salty waters of the St. Lawrence and Saguenay fiord as they come to feed on the food rich supply stirred up by the mixing of the St. Lawrence and Saguenay rivers. In 1970 the Quebec government began acquiring land around the fiord to protect it. 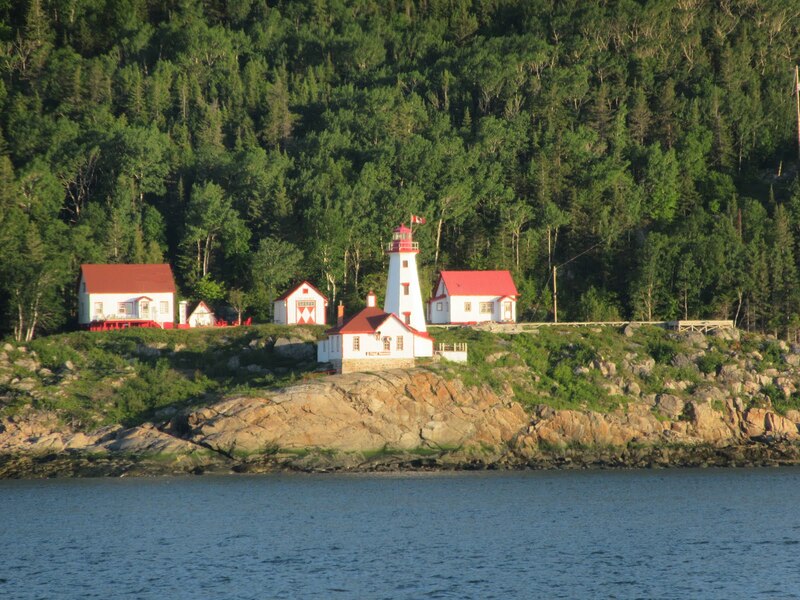 In 1983 the Saguenay National Park was officially created. Guidelines were established for the whale watching industry and for recreational boaters, to protect the whales and to educate the public on the whales and their habitat. The beluga or white whale is an Arctic and sub-attic cetacean. It is adapted to life in the Arctic, so it has different anatomical and physiological characteristics from other cetaceans. Key differences are its all-white colour, absence of a dorsal fin and a distinctive protuberance at the front of its head. This whale has a stocky body and a larger percentage of its weight is blubber. Its sense of hearing is highly developed and its sonar allows it to move about and find blowholes under sheet ice. Belugas form groups of up to 10 animals on average, but during summer they can gather in the hundreds. They are slow swimmers but can dive up to 2,300 feed below the surface. they have teeth and mainly eat fish, crustaceans and other deep-sea invertebrates. The majority of belugas live in the Arctic. Belugas stay in their cold water environment year round rather than migrate to warm waters for birthing as other whale species do. The St. Lawrence River and Saguenay fiord are home to an important population of belugas. In the 1800’s there were as many as 10,000 belugas in this area. Whaling operations almost eliminated this beluga population. The whaling ban in 1979 in this area was made with the hope of helping to restore the population of belugas and initially the population did start to increase to about 1,000. Now however, the population is estimated at just under 900 and falling. The worst year for dead calves was 2012 when sixteen were found dead. Whales were found to be dying of cancer at an unusually high rate in recent years. At this point researchers advise the reasons are unclear. After docking, we searched our Yelp app to find a restaurant for lunch as we continue to eat our way through Quebec. We settled on Cafe Boheme which turned out to be a gem. After, we visited the Tadoussac Whale Museum & Research Centre and watched a film about the research work being done. There was also a great display of whale bones and complete skeletons that helped one gain an appreciation for their size. Later, Fran and I did the boardwalk hike around Point de I’Islet taking in the stunning vistas of the mouth of the Saguenay and views up the fiord. 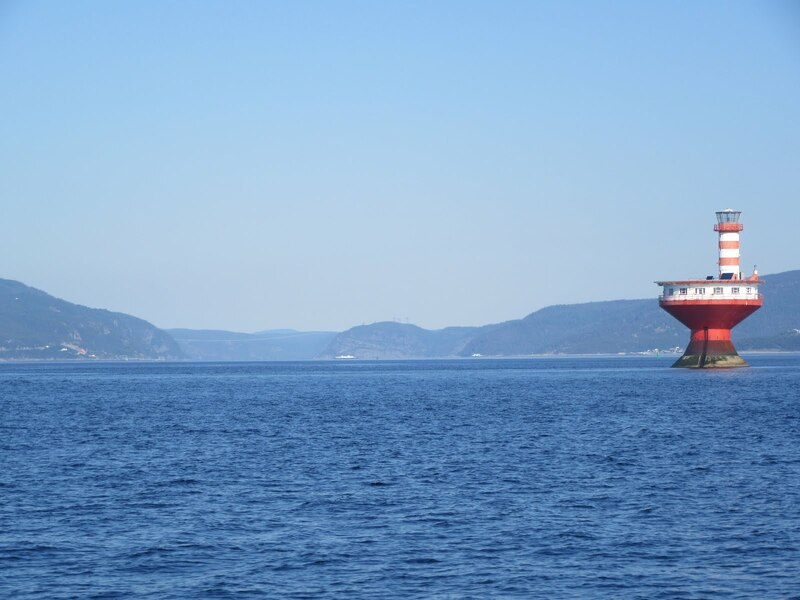 There were no real Canada Day celebrations in Tadoussac. It seems to vary by community. Last weekend’s Saint-Jean-Baptiste day is a more prominent celebration in Quebec. The forecast for Saturday July 2nd included that bright red banner “Gale Force Winds”. We woke to a cloudy drizzly morning. but shortly after, the sun shone and the winds were light, with the promise of more sun, cloud and rain through the day. The forecast did prove to be right as by early afternoon, a wind shift had 20 to 35 knot winds going straight through the harbour and boaters were regularly adding fenders and tending to their dock lines to ensure their boats were safe. Boat Chores: This is a regular part of boating. This includes keeping the exterior decks, cabin and hull clean, engine room checks (oil level, strainers clear of weeds, engine belts ok, a look under the main engine for any sign of leaks etc.). Then there are other “to do” items. 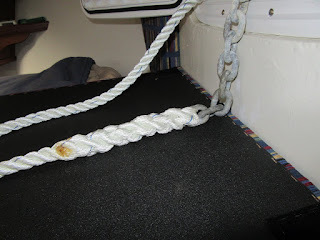 In my case, one long outstanding one was to splice a nylon line (rope) onto our all chain anchor rode to lengthen it in case we need to anchor in deeper water than normal. We carry 175 feet of chain for our anchor and that’s all we’ve used or needed in the 7 seasons we’ve had Tug’n. But there is a real possibility we’ll need to anchor in deeper waters, so we purchased 150’ of 5/8” three strand nylon anchor line that I’d planned to splice onto the end of our anchor chain. Today was the perfect day to do that. I reviewed the instructions I’d saved onto iBooks on my iPad and then set about completing the splice. I’m sure it had been 8 years or more since I’d done a splice of this sort, but it worked out perfectly. Later, we enjoyed a lovely lunch in the marina restaurant while listening to a fantastic playlist from the sixties (Bob Dylan, Joni Mitchell, Cat Stevens etc - my kind of music). 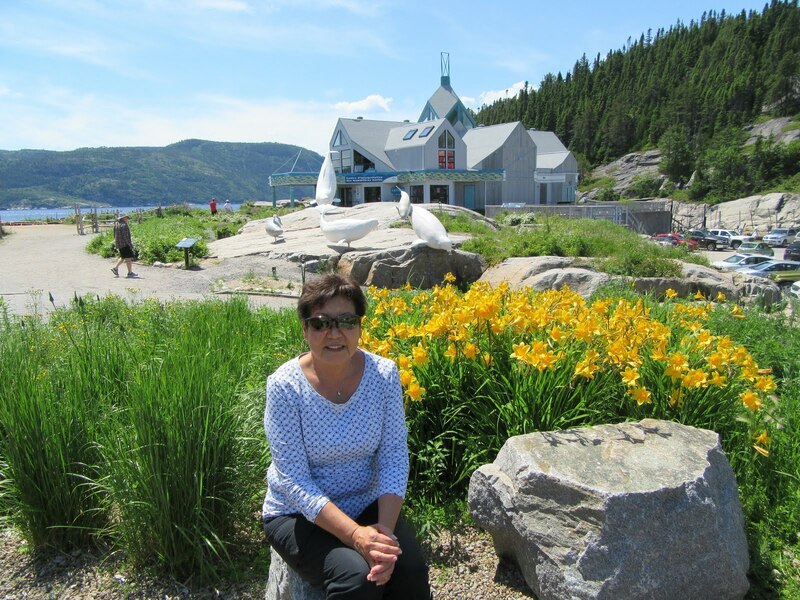 A marina staff member spent time with me discussing what we should see when we head up the Saguenay fiord and where we should consider staying. Except for the high winds, it was a very relaxing day.